Throughout its history, Toronto has been a city divided into many communities and neighbourhoods. As the city has grown, new neighbourhoods have been created out of primarily agricultural land. Over time, the neighbourhoods within existing areas have also been altered and rearranged. The variety and breadth of neighbourhoods within the city has led to the moniker "the city of neighbourhoods". An 1837 planned extension of the New Town, showing the area west of Peter Street to Garrison Creek at Niagara Road. Before incorporation as a city in 1834, Toronto was known as York. For about two decades from its inception in 1793, most residents settled in an area bounded by present-day Jarvis and Parliament streets, south of Queen Street East (then known as Lot Street), and north of Front Street, which at the time was at the waterfront. By 1815, this area was known as Old Town, as a new neighbourhood formed to its west. Extending from present-day Jarvis street to Peter Street (and Blue Jay Way), south of Queen Street West and north of Front Street, this became known as New Town. Sparsely populated in 1815, New Town grew rapidly during the 1820s and 1830s, and a rivalry formed between the two neighbourhoods, especially for the location of the Parliament Buildings. The Ward as seen in 1910. Once the centre of Toronto's Jewish community, it has been completely redeveloped. The earliest Toronto neighbourhoods were the five municipal wards that the city was split into in 1834. The wards were named for the patron saints of the four nations of the British Isles (St. George, St. Andrew, St. Patrick, and St. David) and St. Lawrence, the patron saint of Canada. Today, only St. Lawrence remains a well-known neighbourhood name. The others have attached their names to a variety of still existing landmarks including three subway stations. As Toronto grew, more wards were created, still named after prominent saints. St. James Ward is preserved in the modern St. James Town neighbourhood, while the northern ward of St. Paul's has continued to the present as a federal and provincial electoral district. Early 19th century Toronto was a town of a few thousand people. Most of the rest of the region that today makes up the city was rural farmland dotted with small villages. Some towns such as Norway, Ontario have disappeared leaving only a few traces, but many others, such as Malvern and Wexford have become well known neighbourhoods in the Toronto suburbs. On the main routes leaving the city, small inns and taverns were established, often around the toll booths that were placed on the early highways and these often developed into small towns. There were three main routes out of the city: Kingston Road leading to the east, Yonge Street going north, and Dundas Street heading west. Weston Road was another early route that saw some communities develop. A second type of town that developed in the hinterland surrounding early Toronto were small towns to support the farms that covered most of the region. These tended to develop at the intersection of two concession roads and were usually based around a post office or a small church. In the second half of the nineteenth century, several rail lines were built across the Toronto area. This led to another group of towns being founded as rail lines and rail stations quickly became focal points for the creation of new towns and neighbourhoods. The most important was the Grand Trunk Railway line running along the shore of Lake Ontario. The central Union Station was the meeting point of a number of lines, and this contributed to the growth of industry throughout the area between Queen Street and the lakeshore. East and west of downtown, the major stations were established at Parkdale and Riverside South, they both became centres of activity. Hotels, such as the Gladstone and New Broadview House, opened to serve travellers. Parts of town that had once been home to small rural communities were transformed by the railway into major industrial areas. To the northwest of the city, the small towns of Carleton and Davenport were subsumed into The Junction and it became the site of many large factories and warehouses. To the east, the towns of Strangford and Mortlake became known as Scarborough Junction. Further away from town, the railways also altered geography. New communities developed around railway yards and facilities to house the workers. The largest of these was East Toronto, which developed east of the city around the Grand Trunk's main yards. In the eastern part of Scarborough, Irish railway workers built up the town of West Hill. The existing small town of Leaside grew rapidly after a maintenance yard was built nearby. By the end of the 19th century, the centre of old Toronto had become an almost wholly industrial and commercial area. Some residents stayed behind in these districts, generally poorer citizens and newly arrived immigrants. These became some of Toronto's first ethnically-based neighbourhoods. The working class Irish who laboured in many of the factories were concentrated in the eastern part of the city, and these neighbourhoods were named Cabbagetown and Corktown after them. Jewish immigrants also began arriving in considerable numbers at the end of the 19th century, and they settled in a region that was known as The Ward, centred at the corner of Bay Street and a collection of side streets that would later become Dundas Street. In the early 20th century, Chinatown would develop into another important neighbourhood just to the east. Middle and upper class residents left the core and moved into new areas further out, creating a number of new neighbourhoods. A ring of former farmland around the city was thus developed into new residential areas. These included The Annex, named for its annexation to the city of Toronto, and the former village of Yorkville. This process accelerated considerably at the end of the century with the introduction of the streetcar. The streetcar allowed residents living outside the central business district to travel to work with ease. New areas, again mostly middle and upper class, grew up along the streetcar lines creating new neighbourhoods like Riverdale, The Beaches, Birch Cliff, North Toronto, and Parkdale. Working class streetcar suburbs developed in New Toronto, Mimico and Long Branch in what is now Etobicoke. By the 1920s, most the neighbourhoods of old Toronto had been established. In a non-comprehensive list a 1925 writer to the Toronto Star listed Rosedale, Riverdale, Parkdale High Park, Junction, Danforth, Earlscourt, Wychwood, Willowvale, North Toronto, Beach, and Leaside. All of these neighbourhoods are still commonly used today, with the exception of Willowvale, which is now known as Christie Pits, the name of the park it surrounds having been changed the same way. In 1925, the Post Office divided Toronto into ten postal zones (see map), in an effort to facilitated mail sorting in an era before postal codes. There was no obligation to use the zone numbers, and were originally not widely adopted. After the Second World War, the zone numbers did begin to be used extensively. The postal districts became one of the primary ways of dividing up the city. Residents frequently described themselves as living in Toronto 2 or Toronto 10. The system was retained until 1971, with gradual modification. New zones were added as the city expanded outwards and downtown zones were subdivided as the number of homes and businesses in the core increased. By 1966, the urban areas of the city were covered by 19 zones, while more distant areas had one-letter codes, such as R for Rexdale and W for Willowdale. The years after the Second World War saw a dramatic change to the neighbourhoods of Toronto. The automobile made even more distant suburbs possible, and the baby boom encouraged their rapid construction. The next thirty years saw an explosion of growth in the townships around the city, and the region that soon became known as Metro Toronto. Scarborough, North York, and Etobicoke were transformed from largely rural farmland into vast stretches of housing. The early suburban developers did not put much emphasis on creating neighbourhoods, though in time many of these areas developed strong communities. Some suburbs embraced the names of the small villages that had once been there. Many others were given monikers invented by real estate agents attempting to market the land. During this same era the downtown neighbourhoods saw significant changes. The Financial District was growing northwards and The Ward and many of the oldest parts of Chinatown were demolished to make way for new projects, such as Toronto City Hall. The Yorkville neighbourhood was also transformed from one of homes to one of hotels and stores. The government also demolished many other areas labelled as "slums", replacing them with modern housing projects that were hypothesized to lead to much better lives for the inhabitants. Thus large parts of Cabbagetown and Corktown were levelled to build Regent Park and Moss Park, while St. James Town was transformed into a series of massive highrises similar to Le Corbusier's "Towers in the Park" plan. In the suburbs, municipal governments also created new high rise neighbourhoods such as Flemingdon Park and Crescent Town. Such projects came to a halt by the end of the 1970s when it was realized that such housing projects often became poverty stricken and crime ridden, while many of the untouched parts of Cabbagetown were quickly becoming some of the most desirable in the city. Under mayor David Crombie, new attempts at social housing were launched, such as the St. Lawrence neighbourhood. These have managed to obtain similar densities without the social problems of earlier projects. In the post-war years many traditional neighbourhood names faded as postal district numbers were in common use and many older neighbourhoods declined. The name Riverdale was one that faded as the once middle class area became much poorer. A 1964 Toronto Star series labelled the entire area north of Gerrard as The Danforth. A real estate agent working in the area for several years in the 1970s also reported never hearing the area referred to as Riverdale. Residents and real estate soon found that giving neighbourhoods distinct names and identities made them more attractive. The 1970s thus saw much of the city divided into neighbourhoods. Older neighbourhood names were restored, such as Riverdale, though not before an attempt by real estate agents to rechristen the area Cabbagetown II, after the rapidly gentrifying area across the river. Other areas that had never before had clear names were given them. Some like Leslieville were taken from historic villages that once existed in the area. Others were based upon neighbouring districts such as the Upper Beaches. Not all such attempts at naming areas were successful. Attempts to dub areas as Chester Village or the South Annex never won acceptance. By the 1980s almost all the open areas within the limits of Metro Toronto had been developed, with most of the growth in brand new developments occurring in the belt around Toronto known as the 905. This same era saw a deindustrialization of central Toronto, as almost all the factories and warehouses that had once dominated the waterfront disappeared. This created wide expanses for new developments and new neighbourhoods. A number of new communities have developed and are developing in these post-industrial zones, the largest of them being CityPlace on the former railway lands. To the west and east other residential and cultural zones have appeared in areas such as Liberty Village and the Distillery District. Other stretches of the waterfront, such as the West Donlands, and the Portlands are still mostly empty, and awaiting redevelopment programmes. With the disappearance of open spaces in the city of Toronto and the revitalization of the downtown there has been considerable condominium construction creating residential communities in areas that were once almost wholly commercial, such as the Financial District and Yorkville. The suburbs have also seen considerable densification. North York Centre has grown into a large cluster of condominiums and office buildings and a similar, though less dramatic process, is occurring at Scarborough City Centre. 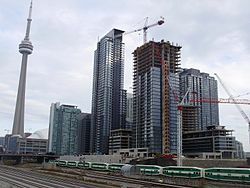 Since the completion of the Sheppard subway line in 2002, there has been a boom in condominium construction along the route. ^ Harris, Marjorie (1984). Toronto, the city of neighbourhoods. Toronto: McClelland and Stewart. p. 128. ISBN 0-7710-3988-3. OCLC 11207684. Retrieved 2009-03-28. ^ Brown, Ron (1997). Toronto's Lost Villages. Polar Bear Press. ^ "Scarborough Community Names". Scarborough Historical Society. Archived from the original on 2008-04-12. Retrieved 2010-02-27.